Take a break from the Las Vegas bustle and have some fun of a different kind on this helicopter tour to one of the Seven Natural Wonders of the World -- the Grand Canyon! You’ll be picked up from your Vegas hotel by a Mercedes Benz van and driven to the helicopter departure site in Boulder City, where builders of the Hoover Dam (formally the Boulder Dam) lived during the dam’s construction in the 1930s. 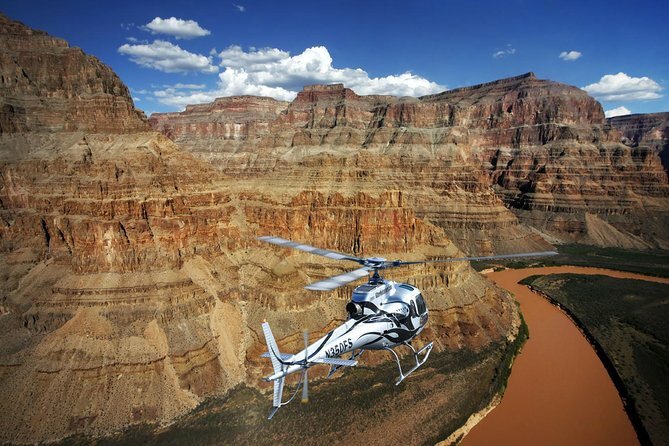 After boarding your state-of-the-art A-Star helicopter, set off on your 70-minute flight to the Grand Canyon. En route, enjoy amazing aerial views of the Hoover Dam and the new bypass bridge, Lake Mead and the Black Canyon. Fly past Fortification Hill, an extinct, colorful volcano, and listen to informative commentary from your pilot. When you reach the Grand Canyon, descend into its depths and soar like an eagle over the Colorado River, past geological rock formations that are millions of years old. Don't forget your camera! Around every corner you’ll see cathedral buttresses and rock pillars with amazing, vivid colors! Your return flight will include sights of other natural wonders, including rock formations of the rugged Mojave Desert wilderness. This flightseeing helicopter tour is truly an unforgettable, once-in-a-lifetime experience. Tour includes an approximate 30-minute landing at Grand Canyon West Airport with time to explore the Hualapai Indian Gift Shop where you can purchase Grand Canyon West and Skywalk memorabilia, jewelry and other items crafted by Native American artisans, and mementos from the Old West.